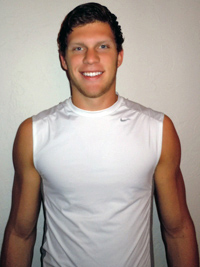 Oklahoma Sooners Blake Griffin Top Pick In NBA Draft! NBA commissioner David Stern, left, poses with the No.1 overall draft pick Blake Griffin, from Oklahoma, who was selected by the Los Angeles Clippers in the first round of the NBA basketball draft, Thursday, June 25, 2009 in New York. Blake Griffin of the Los Angeles Clippers faces a recovery time of up to six months after his injury setback. 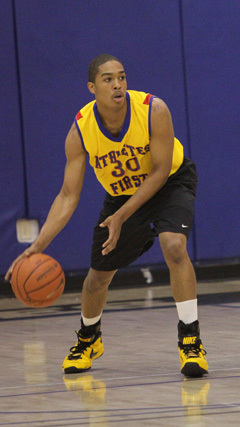 Stevie is a class of 2013 point guard for Douglass High School in Oklahoma City. Athletes First one of only 24 teams in America to be invited to the prestigious NIKE Peach Jam tournament held in Augusta, Ga. July 12th-15th. The Peach Jam features the top Nike teams and players from throughout the country and is an NCAA sanctioned event attended by every major college head coach in America. Following three regular season events, the EYBL Finals at the NIKE Peach Jam is expected to be one of the most exciting week’s of the summer. Held at the Riverview Park Activities Center in North Augusta, SC, the event will feature 24 of the qualifying EYBL 17U teams as well as a separate 16U tournament of 16 teams. The format will continue to provide an exciting basketball format for the hundreds of Division I college coaches and members of the media to scout the top athletes. Kansas freshman Xavier Henry has been named the Phillips 66 Big 12 Rookie of the Week for his efforts in KU’s two wins against Alcorn State and at UCLA last week. Wiping away tears, Kansas freshman Xavier Henry said Wednesday he's headed for the NBA draft because his coaches have helped him get ready. Ford: Who's In, Who's Out? 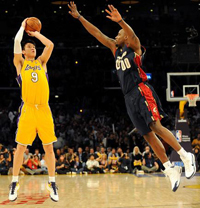 Sun Yue #9 of the Los Angeles Lakers shoots a jumper against Darnell Jackson #00 of the Cleveland Cavaliers during the forth quarter at Staples Center on January 19, 2009 in Los Angeles, California. 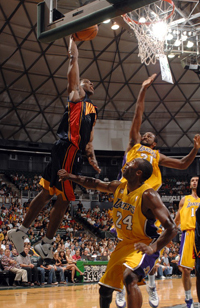 The Lakers defeated the Cavaliers 105-88. The Suns wanted Griffin to get game time but also are trying to get him used to playing small forward. As Iowa's second-tallest player, he wound up playing power forward and center but worked on the perimeter. Oh, thank heaven for Obi Muonelo. The Oklahoma State standout said earlier this week that his senior season wouldn’t be complete unless he was playing in the NCAA Tournament next month, and then Muonelo put the Cowboys on his back Wednesday night to lead them to a 69-64 victory over Iowa State in Ames, Iowa. NCAA Considering Eliminating July Recruiting Period. The Conference Commissioners Association voted 31-0 at its fall meeting in Chicago to recommend eliminating July men's basket ball recruiting beginning in 2012 to the NCAA Division 1 Board of Directors, sources with direct knowedge of the meeting told ESPN.com. According to another source, the Division 1 board will meet Oct 28 and has a number of options; accept the recommendation and implement it immediately or delay the implementation; introduce a new legislation and send it through the normal governance structure; direct a study of options; or do not act on the recommendation. 2010 NIKE Elite Youth Basketball Unveils The Inaugural "EYBL"
Beaverton, Oregon – NIKE, Inc. has announced the launch of its inaugural EYBL (Elite Youth Basketball League) featuring it’s forty-two (42) elite travel team programs beginning this spring with four 17 & under events, culminating with the EYBL 2010 Finals at the NIKE Peach Jam in North Augusta, SC. The EYBL will tip-off at the Boo Williams Sportsplex in Hampton, VA. The final two regular season events will be held at League America in Houston, TX and in Los Angeles, CA over Memorial Day weekend. In addition to the EYBL, the front-end of the summer is designed to help players through skill development. 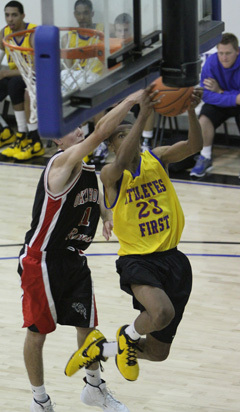 The nation’s best underclassmen tip-off the summer at the NIKE Hoop Jamboree in St. Louis. The elite high school players throughout the country are selected to attend a positional Skills Academy with Utah’s Deron Williams (point guards), Boston’s Paul Pierce (wings), Oklahoma City’s Kevin Durant (wings) and Phoenix’s Amar’e Stoudemire (forwards/centers) held separately in Chicago, IL, followed by a culminating academy for all players with reigning MVP LeBron James at the University of Akron. All five Skills Academies will be closed to college coaches for the participants to focus on improving themselves in both an individual and team setting with special situation drills. Following a successful first year, the King City Classic will return to Cleveland State University’s Wolstein Center in Cleveland, Ohio The event is designed for the nation’s top 80 high school players to compete head-to-head in a national tournament. Hundreds of college coaches, scouts and media are expected to attend. Golden State Warriors guard Kelenna Azubuike, getting the start over veteran Baron Davis who took the night off for rest made his name known throughout the league Thursday night in the Warriors 119-106 victory over the L.A. Lakers. Golden State Warriors guard/forward Kelenna Azubuike, who suffered a left patellar tendon injury during last night’s game at Milwaukee, returned to the Bay Area today and met with team orthopedic physician Dr. Frank Chen at the team’s practice facility. No new information on the injury resulted from today’s meeting, and an MRI has been scheduled for Monday afternoon (November 16) for further examination and diagnosis. Additional information regarding the injury, including specifics about treatment and rehabilitation, will be released when available based on the results of the MRI. 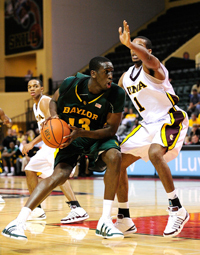 Baylor men's basketball junior power forward Ekpe Udoh announced Tuesday that he will declare for the 2010 NBA Draft, but will not immediately hire an agent. Udoh, who established Baylor and Big 12 Conference single-season blocked shots records with 133 rejections this season, was named to the NCAA South Regional All-Tournament team after averaging 13.0 points and 10.5 rebounds in Houston. The 2010 Big 12 Newcomer of the Year and second-team All-Big 12 selection averaged 13.9 points, 9.8 rebounds, 3.7 blocks and 2.7 assists in 36 games. He became the first Baylor player in the Big 12 era named newcomer of the year and only the third player in program history to garner top newcomer honors - Terry Teagle (1979) and Jerome Lambert (1994) were both named Southwest Conference Newcomer of the Year. Nicknamed "The Nightmare", his 3.69 blocks-per-game average ranks first all-time on Baylor's career list and second on the single-season chart. The Edmond, Okla., native posted a team-best 16 double-doubles, while establishing career-best single-game and single-season marks in points, rebounding, assists and blocked shots. 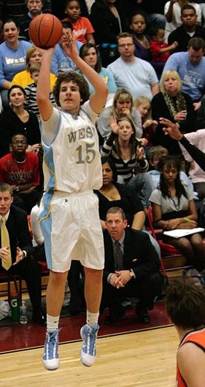 In its 25th year of honoring the nation’s best high school athletes, The Gatorade Company, in collaboration with ESPN RISE, today announced Tyler Neal of Putnam City West High School as its 2009-10 Gatorade Oklahoma Boys Basketball Player of the Year. 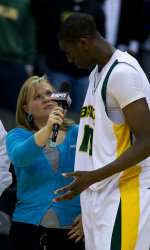 Neal is the second Gatorade Oklahoma Boys Basketball Player of the Year to be chosen from Putnam City West High School. 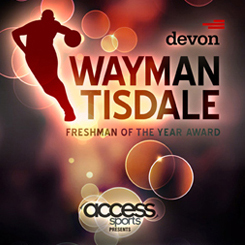 The award, which recognizes not only outstanding athletic excellence, but also high standards of academic achievement and exemplary character demonstrated on and off the court, distinguishes Neal as Oklahoma’s best high school boys basketball player. Now a finalist for the prestigious Gatorade National Boys Basketball Player of the Year award to be announced in March, Neal joins an elite alumni association of past state boys basketball award winners, including Chris Paul (2002-03, West Forsyth HS, N.C.), Kevin Garnett (1992-93, Maudlin HS, S.C.), Chauncey Billups (1993-94 & 1994-95, George Washington HS, Colo.), Jason Kidd (1991-92, St. Joseph Notre Dame HS, Calif.), Paul Pierce (1994-95, Inglewood HS, Calif.) and Chris Bosh (2001-02, Lincoln HS, Texas). The 6-foot-6 senior forward led the Patriots (21-6) to the Class 6A semifinals this past season, averaging 18.6 points and 8.3 rebounds per game while shooting at 65 percent (95-for-146) from inside the arc. 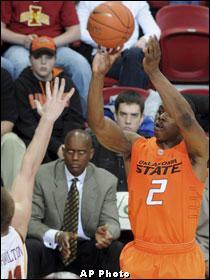 A 2009 First Team All-State selection, Neal helped lead Putnam City West to its first state tournament berth in 33 years. In the Patriots’ 53-41 quarterfinals win over Muskogee High, Neal led all scorers with 17 points and also grabbed 10 rebounds. Neal has maintained a 3.70 GPA in the classroom. An active member of his church community, he has been a member of his school’s student government organization and has volunteered locally as a youth basketball coach. Neal remains undecided upon a college destination. Neal joins recent Gatorade Oklahoma Boys Basketball Players of the Year Xavier Henry (2008-09 & 2007-08, Putnam City) and Blake Griffin (2006-07, Oklahoma Christian School) among the state’s list of former award winners. Baylor junior forward Ekpe Udoh was named the Phillips 66 Big 12 Rookie of the Week for Nov. 23-29 Monday in voting by a panel of media covering the conference. EAST RUTHERFORD, NJ - JANUARY 13: Shelden Williams(notes) #13 of the Boston Celtics shoots against Yi Jianlian(notes) #9 of the New Jersey Nets on January 13, 2010 at the IZOD Center in East Rutherford, New Jersey. 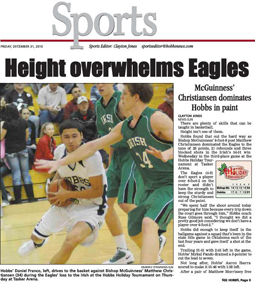 Notre Dame has set the bar high for the other programs chasing after Matt Christiansen. The junior power forward from Oklahoma City has been on the Irish coaching staff's radar for a while, recently drawing assistant coach Martin Ingelsby to an open gym. Christiansen visited South Bend for the first time as a recruit last weekend. Now everybody else is playing catch-up. Michigan coaches continue to extend offers and invitations for visitors. An Oklahoma junior big man recently visited Notre Dame and will take in U-M, Penn State and others in the weeks to come. 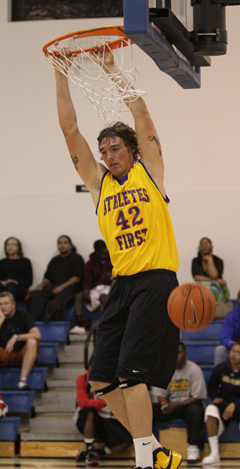 Oklahoma City Bishop McGuiness 6-8, 230-pounder Matt Christiansen spent the summer with Athletes First on the AAU circuit, earning his way on to some services' top-100 lists. He'll visit Ann Arbor this weekend, State College Oct. 30 and Colorado Nov. 13. "I've had some draw to Michigan for a while now, ever since I went there for a football game [vs. Notre Dame in 2007]," he said. "I was obsessed with it… the weather, the campus, Ann Arbor. It's a good academic school like Notre Dame with All-American tradition. They've had good athletics for a long time … I like everything about the school and what it represents." Christiansen started showing interest in Michigan a few weeks ago, contacting the coaches and sending film. The U-M coaches invited him to visit days later. Is A Major Hit In OKC! By Rick McCormick, Owner of Southwest Hoops Inc. In March 2010 a group of basketball players from around the State of Oklahoma came together in North Oklahoma City for a Saturday and Sunday of pure basketball skill development, improvement, and of course some full court play. In a time and era when we sometimes hear negative comments about todays youth it is an absolute pleasure to be a part of an event such as this. As a long time college basketball coach, I love to see young players outside of their season working on their fundamental skills and putting in time trying to improve their game and grasp their dreams. There are probably many things that teens can be doing on a Saturday and Sunday which do not involve spending 12 hours inside a gymnasium 'hooping”. 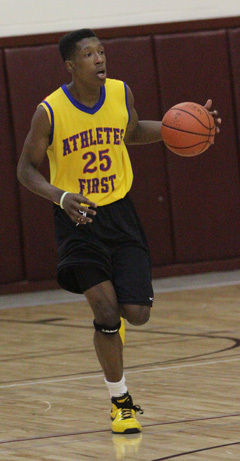 That is precisely what Athletes First Director, Gary Vick had taking place on this weekend in March. 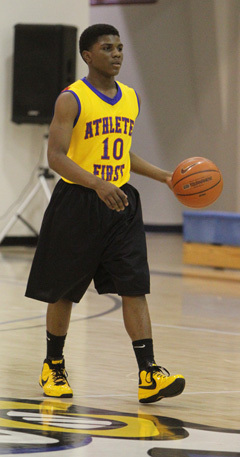 Athletes First is one of only 40 NIKE sponsored programs in the U.S. Athletes First was the AAU National Champions as recently as 2008. 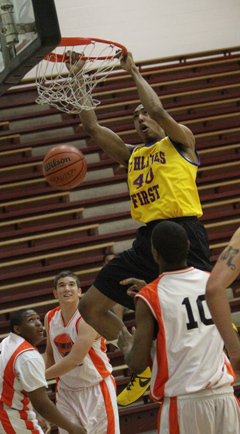 The Combine had players from the 7th grade through 11th grade, from throughout the State. One court had primarily 7th and 8th graders, another had primarily 9th and 10th graders, while the third court had the older 10th and 11th graders. Of course, there were a few exceptions where skill level deemed that some players were playing “up” with players slightly older than their chronological age. The older court was manned by Coach Carl Henry, a former collegiate star at Kansas and a professional player of several teams and leagues. One of the things I really like about the Athletes First program is that it is NOT just a weekend of pick-up play games. There is a testing phase of the camp to assess wing span, vertical, and numerous physical attributes. There is a heavy emphasis on fundamental skills. The early part of the day is devoted entirely to fundamentals before any play begins. As I evaluated the Combine, it was evident there was a lot of talent in each of the age groups. When evaluating players, I always like to point out that players can always play themselves both up and down during the next few months or years. Many times this is the case of very young kids. There was not an abundance of NCAA Division I players in the 2010 class in Oklahoma. However, that is going to change a bit over the next three years, as I see many prospects with Division I potential coming up through the ranks. The vast majority of those players were at this weekend event. It will be interesting to evaluate the progress of these kids over the Spring and Summer of 2010 as many of them step out and compete on a Regional and National level. There are plenty of reasons to be excited about the future of Oklahoma High School basketball over the next several years. NIKE Elite Youth Basketball Unveils The Inaugural "EYBL"
Beaverton, Oregon (March 4, 2010) – NIKE, Inc. has announced the launch of its inaugural EYBL (Elite Youth Basketball League) featuring it’s forty-two (42) elite travel team programs beginning this spring with four 17 & under events, culminating with the EYBL Finals at the NIKE Peach Jam in North Augusta, SC from July 12-15, 2010. 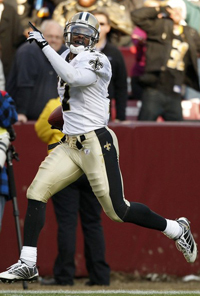 New Orleans Saints Robert Meachem scores a touchdown on a fumble return against the Washington Redskins in the second quarter of their NFL football game in Landover December 6, 2009. Edmond Santa Fe’s Josh Richardson is ranked No. 103 on the current Rivals 150 for the basketball recruiting class of 2011. Richardson, a 6-foot-5 shooting guard who helped the Wolves to the Class 6A state semifinals last March, is the only Oklahoma player currently on the list. He also ranks as the No. 29 shooting guard in the country. Playing for Athletes First, Richardson has drawn national attention this summer after a strong junior campaign that earned him a spot on The Oklahoman’s Super 5. Aside from several local and regional colleges that are keeping an eye on Richardson, he also has strong recruiting interest from the west, with programs like Arizona State and UCLA. Many University of Kentucky fans are waiting to see which of their talented freshman will be the first to put their name in this years upcoming NBA draft. It has been a foregone conclusion that John Wall and DeMarcus Cousins will both be top ten draft picks in this years upcoming draft and the play of Eric Bledsoe throughout the season has put his name on the list of players that have a chance to be drafted in the first 13 picks, which are considered the lottery picks of the NBA draft. Daniel Orton, the sixth man of the team and the freshman who seemed to have the most to gain by returning for one more season, might not be seeing it the same as everyone else. Orton's father, Larry Orton, told The Courier-Journal in Louisville, Kentucky that his son has already made up his mind and would be dropping out of school to head to California to prepare for this year's draft. A few mock draft website's have Daniel Orton rated as late first round draft pick for the 2010 draft but a potential top ten pick in the 2011 draft. This season Daniel Orton averaged 3.4 points, 3.3 rebounds in 13 minutes of playing time as a back up to Cousins and junior Patrick Patterson. Daniel said there is no truth to what his father said about him already deciding to turn pro after just one year at the University of Kentucky and he is still weighing his options. The bigger question besides if he will or will not turn pro, will be which NBA team will take a chance on a player based solely on potential in the first round of the draft. Orton showed at times during the season that he can be a force on the inside on defense for any team. 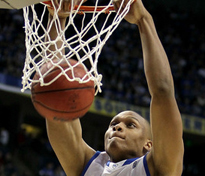 In a game against the North Carolina Tarheels Orton blocked three consecutive shots in the same Tarheel possession. What Orton showed the most throughout the season was his raw ability to work hard around the basketball but also his limited offensive ability and knack for picking up cheap fouls. Hopefully this decision will not turn out to be a Randolph Morris type decision that occurred in the 2005 NBA draft for the then Kentucky freshman center. Morris went undrafted after a above average freshman season to only return to the Wildcats because of a stipulation that allowed players to return to school if they had not signed with an agent and went undrafted. Should be a wild and interesting offseason in Lexington.